When I moved to London 7 years ago to start working in the restaurant industry, one of the first things I did was poll my esteemed colleagues for the best London restaurants. A name that showed up in several of the replies was Hibiscus. All these years later, I still haven't managed to go. So when I was invited for lunch at The Cube, the restaurant popup organised by Electrolux, I was first surprised, then very happy, and when I found out that Claude Bosi of Hibiscus would head up the kitchen I was really excited! 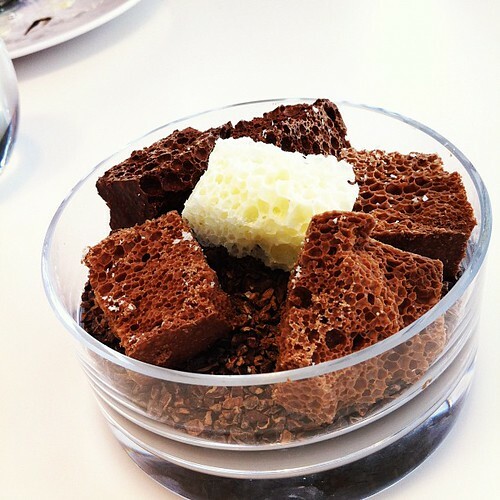 Anyone with an interest in restaurants have probably heard of The Cube by now. With previous runs in Milan and Brussels, this year sees the space ship like one room restaurant (check out these photos) descend on London. 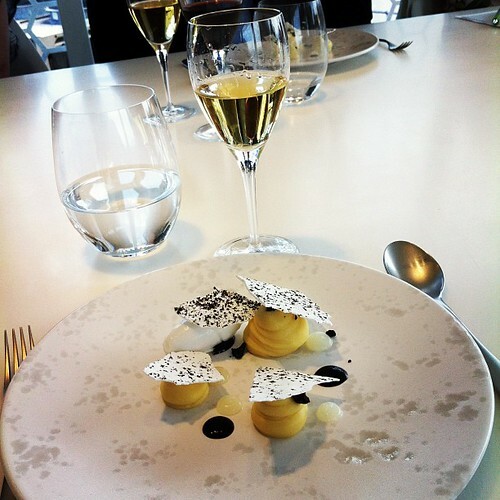 During four months a number of well renowned chefs from all over the UK take turns serving world class food paired with excellent wines while the diners enjoy a unique view of the London skyline. Enough with the marketing spiel, let's just sum it up as being quite cool. Despite that, being in the middle of wrapping up my employment at Livebookings, I actually managed to forget the whole thing! 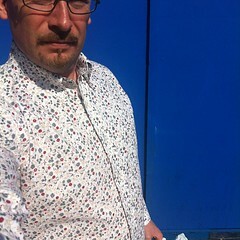 Left for work in a scruffy t-shirt, so when I remembered where I was going for lunch I went shirt hunting on Lower Marsh. Found what I myself consider a rather stylish shirt, in the spirit of Paul Winch-Furness, the restaurant photographer with the coolest name. After travelling to the sixth floor of Royal Festival Hall in the singing elevator (yes, there were people travelling up and down just to listen to the lift doing it's thing), I was guided to the balcony with a glorious view of the South Bank. As I turned the corner and saw the entrance to The Cube itself I almost felt like I was set to embark on a space flight. It looks like a set piece from 2001, A Space Odyssey. That 60s space opera "timeless" (at the time...) look married with clean Scandinavian simplicity. It looks great. While we were plied with bubbly our friendly hosts talked about how the whole thing had been organised (they have been working on this since December last year...), and I met the lovely Celina Mann who blogs over at "Portsmouth Food Lovers" and May Chong of "Slow Food Kitchen". We were then seated at the table and had the mandatory Electrolux marketing talk (and this was actually the only time during the entire four hours that Electrolux was mentioned) delivered by our excellent sommelier who's name I have rudely forgotten (hey, it's his own fault, pouring all that fantastic wine down my greedy gullet), and then the lunch started. And what a lunch. To a playlist put together by Claude Bosi, who apparently is big into his jazzy sounds, we were treated to seven courses with matching wines, all introduced by mr Bosi who happily answered questions and explained how the dishes were made. 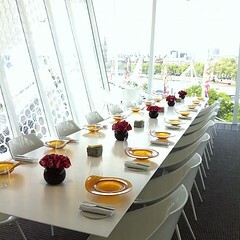 Dining at The Cube is quite the spectacle. The Cube is just one room, with dining area and kitchen section just next to eachother, so guests are encouraged to walk over and watch what's going on and ask questions. Normally, with such an extensive menu being served, by the end of it I have a favourite or two. This time I was really hard pressed to pick one, it was all splendid. 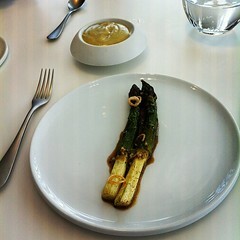 Perhaps the very first dish stood out, confit asparagus cooked in butter infused with toasted hay. Served with a dark hollandaise made from said butter. Melt in mouth perfection, I don't think I have ever tasted asparagus that good. While it isn't the cheapest meal in London (seats are priced at £175 per person for lunch and £215 for dinner), and to be clear, I didn't have to pay for my visit, I would say that the experience is incredibly impressive and I left feeling very satisfied. Unique, generous, world class, unrivalled, iconic, exciting, all the words used in the marketing of The Cube hold true. Plating up with tweezers... Daintiness factor: 100. Result. 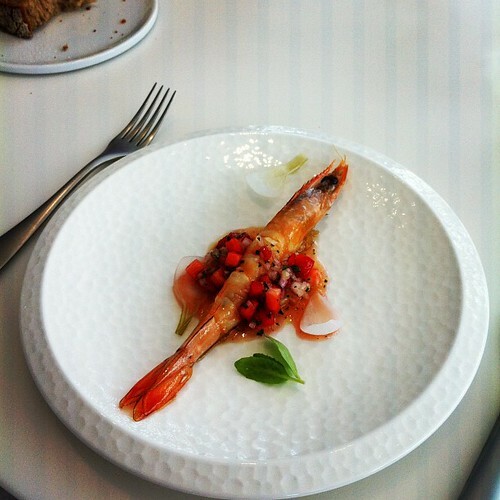 Shrimp served with an onion and strawberry sauce. Worked amazingly well together. Everything I love on a plate. 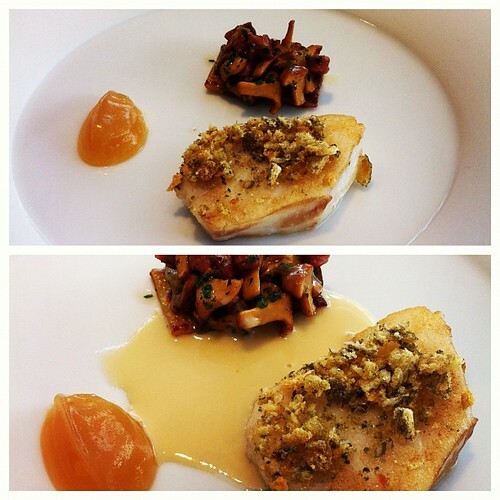 Fish, mushroom, bacon. And ketchup! Mushroom ketchup, that is. 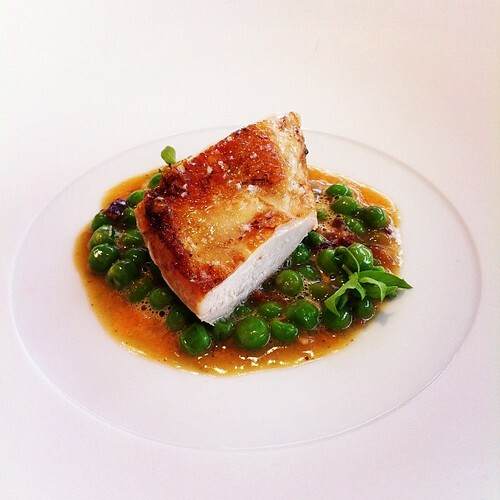 Chicken on a bed of peas and a sauce with ginger and pink grapefruit. Mr Bosi wanted to specifically point out that this was made from English chicken, as he feels it is not just as good as the French but also much cheaper. There you go. We were treated to some delicious desserts. 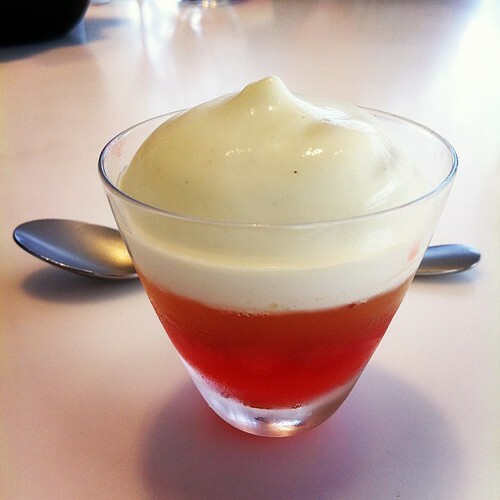 Here strawberry with a celeriac cream! This is apparently a classic Hibiscus dish, but Claude will not say what it is. I won't ruin the surprise, just confirm that it is absolutely fantastic. A nice little finishing touch. This is what Aero Bubbly Chocolate should taste like! The Cube, unique pop up restaurant by Electrolux previously featured in other major European cities, is setting up shop right outside my office on South Bank. We wrote a bit about it on the Bookatable blog a while back. It's truly a unique concept. Being in London for a mere 3 months, it's bound to book up quickly. Me being a notoriously bad planner, I hardly think I'll be able to get a ticket. This is one of the few foodie events I'd really like to do this year though. Here's a new year's resolution I know I'll keep: I will go back to Pitt Cue Co on Newburgh Street in Soho to get my 'cue fix as often as digestively possible. Today Pitt Cue Co opens up in Soho, London. What started as a (mind blowingly well executed) food truck on the bank of the Thames is now a proper sit down restaurant serving amazing barbecue with almost all the usual, and some not so usual, trimmings. Apologies for the lack of photos, but when our food arrived I was simply so excited that I forgot to take photos. Once I started diving in, my fingers too sticky to be allowed near my iPhone. There are of course other bloggers with greater presence of mind than I. The as always brilliant Hollow Legs transcends mere restaurant reviewing by bringing a doggy bag home to make dumplings (genius), while Noshable features photos by the remarkable Paul Winch-Furness. For a Pitt Cue Co photo blow out bonanza, check out Paul's own gallery. Go, go, go. Prepare for some wait time as there are only about 30 seats. Don't worry, it's so worth it and once in the bar there will be plenty of beverages to keep you entertained, from pickle back shots to cocktails. Ask for the Cider Sour. The only thing I felt missing from the perfect barbecue joint was grilled corn. And generous piles of wet wipes. Week before last I went to Istanbul to give a presentation on social media on a workshop organised by MCI. But interesting as that was, this blog post won't be about that. Me and my friend M, who have been to Istanbul many times, did a whirlwind tour of a few bars and restaurants. We visited the roof top bar of the Marmara Taksim hotel, the lovely little restaurant Leb-i-derya (where we had an amazing fillet steak with something called "40 spices sauce"), and the well hidden away bar/restaurant Mangerie in Bebek. But the place that made the greatest impression on me, and where I had the best plate of food, was The House Cafe in Ortaköy. Absolutely fantastic. The kind of polished restaurant concept that gives me goose bumps. Like Riding House Cafe, Dishoom, Hawksmoor, Byron and Polpo in London. 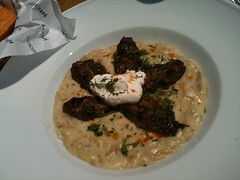 With my limited knowledge and experience, the menu seems firmly rooted in Turkish food and ingredients. 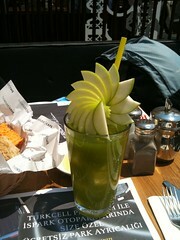 They have also created a few items unique to them, like their own house olive oil, and this apple lemonade drink which doubles as a fresh apple snack board. The staff were all welcoming and friendly, and when we wanted to move tables out from the beating sun and into the shade (where they also had free WiFi), they didn't even bat an eye lid but with a smile helped us move all our bags (already checked out from the hotel...) and plates. The design takes inspiration from the 20s/30s, you can easily spot the influences, but it has been tweaked to feel fresh and modern and fit in with Istanbul of today. Like Turkey itself (this is my impression from my meager two visits to the country...), The House Cafe makes an effort to bridge new and old, show progress while preserving and caring for their roots. Behind The house Cafe is the award winning design and architect firm Autoban. They have not only created the concept and the interior design, they are also responsible for a lot of the furniture and decorations seen throughout the restaurant. And the furniture is of course also sold in their shop. 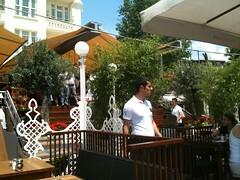 There is a hotel attached to the restaurant as well, and I am quite keen to book with them next time I go to Istanbul. Enough about the place, moving on to the best plate of food I had in my three days in Istanbul. Not only was it incredibly tasty, packed with flavour and with a lovely creamy texture, it also felt like the perfect Low Carb High Fat dish. That dish is, and I quote from the menu "The House made spicy meatballs on aubergine puree; served with strained yoghurt and cayenne pepper infused melted butter." Delicious. The aubergine puree is also mixed with molten cheese, which makes this a proper calorie bomb despite not looking very much. Believe me, this would keep you going all day, and if you try to stick to an LCHF diet this is the kind of restaurant dish that makes you feel warm inside. My next goal is to try and find the recipe for this style of aubergine puree (pointers welcome) so I can make this at home.